Introduction: Thrombocytopenia is a potential complication of hemodialysis (HD), and its occurrence has been described even with highly biocompatible polysulfone (PSf) membranes. Dialysis units routinely monitor platelet (PLT) count at the beginning of HD sessions. However, considering that the long-term effects on PLT count could easily be missed, the prevalence of HD-related thrombocytopenia could be underestimated. In the present study, we aimed to investigate the following: 1) the long-term impact of HD treatment on PLT count, comparing two families of dialysis membranes made up of similar PSfs; 2) whether the switch between the dialysis membranes studied significantly affects PLT count; and 3) the prevalence and the risk of HD-induced thrombocytopenia according to the dialysis membranes used. Methods: A cross-sectional retrospective study was performed comprising 157 adult chronic HD patients. The HD membranes under investigation were of the series FX, Helixone® Fresenius (Filters A), and Polyflux® Gambro (Filters B). Patients were treated in 4 dialysis units in Southern Switzerland. Data were collected from a centralized computing platform. Findings: PLT count significantly differs between Filters A and B with, respectively, 188 (153–243) ×10E9/L versus 214 (179–255) ×10E9/L (p=0.036). The prevalence of thrombocytopenia was higher for Filter A compared with Filter B (28.4% versus 12.8%; p<0.001). The switch from Filter A to Filter B significantly affected PLT count: from 189 (146–217) ×10E9/L to 217 (163–253) ×10E9/L (p<0.001; analysis on 26 patients). A linear random-intercept model confirmed the results (β coefficient =35.214; SE =5.956; p<0.001). In a mixed-effects logistic regression model, the risk of thrombocytopenia for Filter B was 0.157 (CI =0.056–0.442). Discussion: Our data suggest that among the PSf membranes studied, the FX membrane induced a lasting decrease in PLT count and caused significantly more thrombocytopenia. Prospective studies are warranted to verify our findings. Several cases of HD-associated thrombocytopenia have recently been reported in patients treated with highly biocompatible polysulfone (PSf) membranes, most of them from the Optiflux family (Fresenius Medical Care), 10 cases,9–12 and only a few from other companies (one case with a Polyflux from Gambro and 3 cases with electron-beam-sterilized unspecified dialyzers).11,13–17 According to these reports, the HD-induced drop in PLT count resolved or improved after switching to an alternative synthetic or semisynthetic HD membrane. Furthermore, findings from a cohort study of HD patients in two Canadian provinces have indicated an association between the use of electron-beam-sterilized dialyzers and a drop in post-HD PLT count . The risk of thrombocytopenia in this large cohort was 2.52 (95% CI =1.20–5.29, p=0.02) with a reported 7% incidence of a significant decrease (>15%) in post-dialysis PLT count among patients who underwent HD with dialyzers sterilized by electron beam. Dialysis units, however, routinely monitor complete blood count (CBC) at the beginning of the HD sessions only, and the sneaky long-term effect on PLT count, if one, might not be clinically self-evident, thus underestimating the incidence and the entity of HD thrombocytopenia. From a clinical perspective, the impact of HD membranes on PLT count could be not only of academic interest but, for some patients, crucial. Yet, to the best of our knowledge, there are limited data about the comparative long-term impact on PLT count of different PSf membranes. In the present study, we aimed to investigate the following: 1) the long-term impact on PLT count comparing two families of steam-sterilized dialysis membranes made of similar PSf; 2) whether switching from one membrane type to the other significantly affects PLT count; and 3) the prevalence and risk of HD-associated thrombocytopenia among patients treated with one of the two membranes studied. Eligibility criteria for enrollment included the following: 1) regular chronic HD treatment 3 to 4 hours 3 times a week for at least 6 months before the beginning of the data analysis; 2) age >18 years; 3) availability of at least 6 predialysis CBC; and 4) HD treatment performed with PSf-based membranes. Exclusion criteria were as follows: 1) presence of systemic or hematological diseases that could interfere with PLT counts (including hematological cancers, myelodysplastic syndrome, baseline thrombocytopenia from any cause, acute infection, idiopathic thrombocytopenic purpura/thrombotic thrombocytopenic purpura, human immunodeficiency virus infection, or liver disease with abnormal baseline PLT count) and 2) HD performed with a non-PSf-based dialysis membrane (Figure 1). We retrospectively collected data of 191 ESRD patients aged ≥18 years on a regular thrice weekly HD program in 4 dialysis units. For our comparative analysis, we included only patients treated with HD membranes made up of nominally similar PSf. The HD membranes under investigation were of the series FX, Helixone® Fresenius (Filters A), and Polyflux® Gambro (Filters B). Figure 1 presents the flowchart of the study: Data from 7 patients were excluded because their HD sessions were not performed with membranes of the PSf family, and 27 patients were excluded because of the presence of systemic or hematological diseases that could interfere with PLT production or consumption. The final data analysis was thus based on 157 patients. For each patient, we collected data about the type of membrane currently used as well as laboratory data of the 3 months preceding the inclusion and of the 3 months preceding the last registered intra- or between-families membrane change. We retrospectively collected patient demographic and anthropometric characteristics, renal history, HD treatment parameters, and laboratory data from the electronic medical records of all HD outpatients aged ≥18 years treated in the EOC units. Data included gender, age, body mass index, coexisting illnesses (ie, diabetes, hypertension, and history of cerebrovascular or cardiovascular disease), causes of renal failure, type of dialysis membrane currently in use, and type of dialysis membrane previously used. Laboratory data were based on results routinely collected for monthly examinations and included predialysis CBC (collected using an automatized ADVIA® 2120i Hematology System; Siemens Healthcare, Erlangen, Germany) with white blood cell count, red blood cell (RBC) count, PLT count, hemoglobin (HB), and hematocrit. We collected data from 3 consecutive monthly CBCs for the filter currently in use and for the one previously used. Thus, for each patient, 6 CBC data sets were collected. All CBCs were performed in the Central Laboratory of the EOC with no changes in methods or apparatus during the time of investigation. Descriptive statistics are presented as median (interquartile range [IQR]) or mean ± SD for continuous variables and as numbers and percentages for categorical variables. Continuous and categorical variables were compared by using Welch’s t-test or Wilcoxon rank sum test and χ2 tests, respectively. The data structure was composed of 6 repeated measures of PLT count for each individual. To account for within-individual correlation, random intercept models were used. The exposure of interest was defined as the type of filter, and variables considered for the multivariate modeling included age, gender, leukocyte count, RBC count, and HB. Likelihood ratio test was used to compare nested models and in particular to assess the difference between the types of filters. In order to analyze differences in PLT count which occurred due to dialysis membrane, we used a linear mixed-effects model. We report β coefficients that represent differences between means, with SEs and p-values. We used the subset of patients previously treated with the dialysis membrane Helixone and switched for unrelated reasons to Polyflux to investigate whether the change of the dialysis membrane significantly affected the PLT count. In order to determine the impact of dialysis membranes on decrease in PLT count, we implemented a mixed-effects logistic regression using significant thrombocytopenia (defined as an absolute PLT count of <150×10E9/L) as the response variable. Odds ratio (OR) and 95% CIs were calculated. Data analysis was performed using R statistical software. Statistical significance for all outcomes was set at p≤0.05. Figure 1 presents the flow diagram of the selection procedure of the participants included in the analysis. 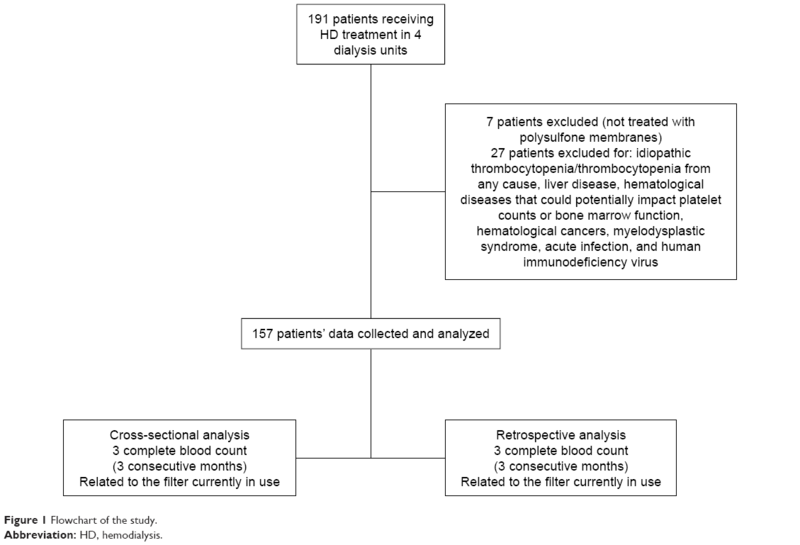 Table 1 shows the clinical and biochemical features of the 157 dialysis patients included in the analysis. The average age (SD) of the participants was 73±12 years, and a large proportion of participants presented associated comorbidities: 92% hypertension, 55% dyslipidemia, and 46% diabetes. The main dialysis membrane used was Filter A (Helixone; 67% of patients). Filter B (Polyflux) was used by 33% of patients. Table 1 shows the results of CBC for both the cross-sectional and the retrospective analyses. CBC parameters are expressed as the average (SD) of 3 consecutive/monthly measurements. Descriptive statistics of CBC parameters are comparable for the cross-sectional phase and retrospective phase. Notes: n=157. Continuous variables are expressed as mean ± SD; categorical variables are expressed as numbers and percentages. Abbreviations: BMI, body mass index; CBC, complete blood count; CHD, coronary heart diseases; CVD, cerebrovascular diseases. We analyzed data concerning CBC parameters by HD membrane currently used as shown in Table 2. A significant difference in PLT count between filters (p=0.036) was detected. The median (IQR) of PLT count was 188×10E9/L (range =153×10E9/L–243×10E9/L) for Filters A (Helixone) and 214×10E9/L (range =179×10E9/L–255×10E9/L) for Filters B (Polyflux). The proportion of patients with thrombocytopenia was higher for Filters A (Helixone) compared with Filters B (Polyflux; 28.4% versus 12.8%; p<0.001). 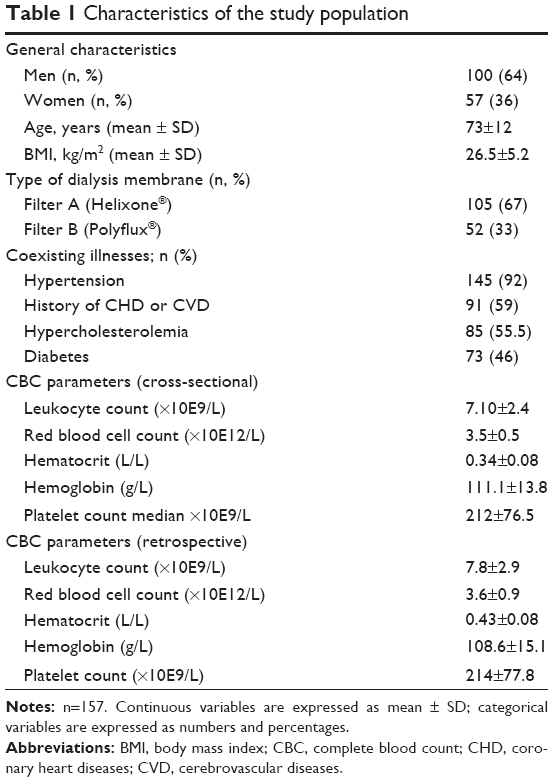 Eleven episodes (3.5%) of severe thrombocytopenia (PTL count ≤100×10E9/L), all of them in Filter A users, were registered (in one case with PTL count ≤50×10E9/L). During the period considered, no cases of drug-associated and more specifically heparin-induced thrombocytopenia were detected. Anti-PF4/heparin antibodies were not assessed. Notes: Values are expressed as median (interquartile range). aThrombocytopenia = platelet count of >150×10E9/L, and values are expressed as (%). All p-values refer to a Wilcoxon rank sum test, except for that of thrombocytopenia that comes from a χ2 test. Abbreviation: CBC, complete blood count. Furthermore, we investigated whether a change in the HD membrane significantly affected long-term PLT count, in a subset of 26 patients, switched for unrelated reasons from Filters A (Helixone) to Filters B (Polyflux). We analyzed, retrospectively, the PLT count from 3 consecutive CBC measurements before the switch and compared them to the values during the current treatment with Polyflux. The median (IQR) value of PLT count was 189 (146–217) with Filters A (before the switch) and 217 (163–253) with Filters B (after the switch; p<0.001; Figure 2). The two groups of filters under analysis did not show significant differences in the monthly dose of prescribed erythropoietin (mean ± SD, Filter A versus Filter B: 80.7±6.3 versus 75.3±6.8 μg, p=ns) and in the percentage of patients treated with unfractionated heparin, with low molecular weight heparin, and without anticoagulation during the dialysis session (Filter A: 40.2%, 55.9%, and 3.9%; Filter B: 41.2%, 52.9%, and 5.9%, respectively; p=ns). Linear random intercept models were used to examine the association between types of filters and PLT count. 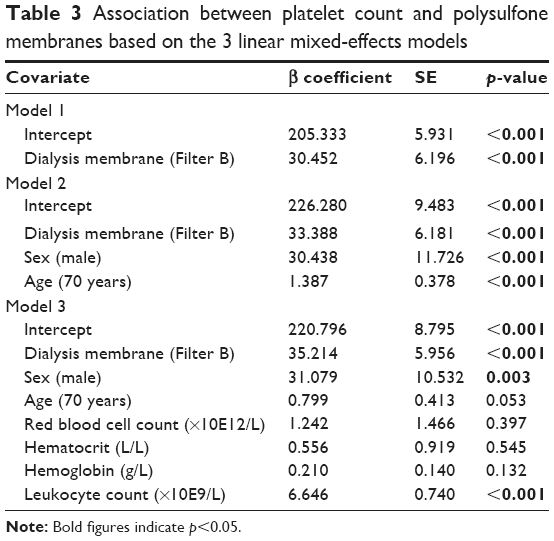 The Polyflux filter increases PLT number in all models; the findings were also confirmed in the multivariate modeling that included age, gender, leukocyte count, RBC count, and HB. A significantly higher PLT count was seen with Filters B (β coefficient =35.214; SE =5.956; p<0.001; see Table 3 for details). The exposure of interest was defined as the type of filter; the variables for the multivariate modeling included age, gender, leukocyte count, RBC count, and HB. A Likelihood ratio test was used to compare nested models and in particular to assess the difference between the filters. 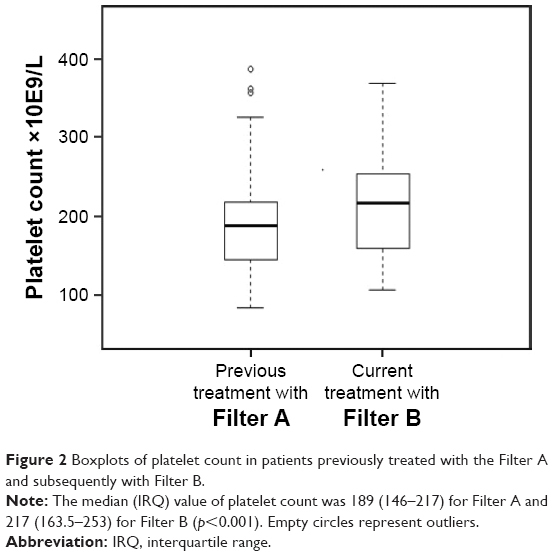 Figure 2 Boxplots of platelet count in patients previously treated with the Filter A and subsequently with Filter B. Note: The median (IRQ) value of platelet count was 189 (146–217) for Filter A and 217 (163.5–253) for Filter B (p<0.001). Empty circles represent outliers. In a mixed-effects logistic regression model, we predicted the risk of thrombocytopenia. 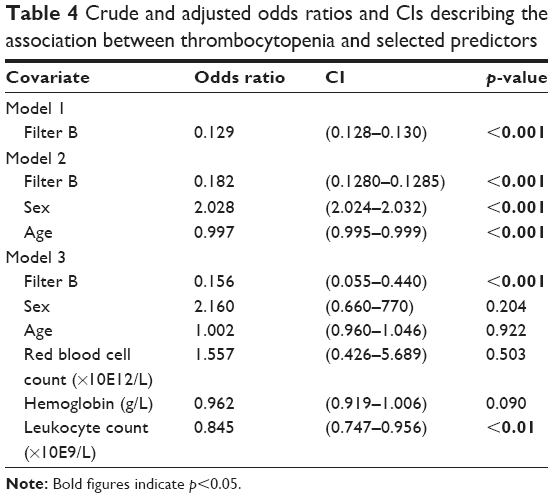 The use of Filter A was confirmed to be an independent predictor of thrombocytopenia, also after adjusting for other covariates with multivariate analysis (Filter B: OR =0.157, CI =0.056–0.442; see Table 4 for details). In this retrospective cross-sectional study, we describe the long-term comparative effect of two families of HD membranes made of similar PSf on PLT count. The use of electron-beam-processed membranes and, in case reports, even of steam-sterilized PSf dialyzers has been associated with the development of HD-related thrombocytopenia. Furthermore, it has been assumed that the degree of PLT activation during HD may differ among synthetic membranes as a result of their specific biochemical characteristics.19,20 A drop in PLT count resulting in significant thrombocytopenia at the end of the HD session has been described, but little is known about the long-term effects on PLT count and about possible long-term differences between synthetic membranes. The peculiarity of dialysis membranes, especially the older, nonsynthetic ones, of activating and retaining PLTs was repeatedly reported.21,22 Recently, findings of a prospective study showed that the increased PLT consumption during HD results in a compensatory release of immature PLTs from the bone marrow.23 In our study, we analyzed twice the results of 3 consecutive monthly CBC determinations routinely performed at the beginning of the HD sessions. Our findings suggest that the registered significant difference in PLT count between the two PSf families under study could be a consequence of the blood–membrane interaction in the dialyzer. The prevalence of significant thrombocytopenia (PLT<150) in turn differs between the membranes studied with, as expected, a higher prevalence with Filters A (Fresenius FX, Helixone). We investigated the same membranes analyzed here in two previous perspective crossover studies. In the first one, comparing the same two membranes, we demonstrated, by measuring higher D-dimer levels in the dialyzer rinsing fluid, that the contact activation of coagulation during HD was more pronounced for Filter A in comparison with Filter B.24 Even though it is not possible to draw conclusions, we can speculate that these findings might be related. Furthermore, interactions between coagulation and complement systems were extensively analyzed, and the involvement of the PSf HD membranes in complement pathway was demonstrated in proteomic studies on protein adsorption pattern performed with biomaterials used for HD membranes. These studies have demonstrated that PSf adsorbs ficolin-2, a molecule that participates in the lectin-dependent complement pathway, confirming that the membrane could be able to activate the complement.25,26 In addition, a crossover clinical study on PLT activation demonstrated a significant increase in the GPIIb/IIIa PLT membrane receptor expression during HD sessions with PSf, but not with cellulose triacetate membranes.27 This glycoprotein binds to adhesive proteins such as von Willebrand factor and fibrinogen or their fragments, mediating PLT aggregation and adhesion.28 In addition, proteome maps obtained after in vivo HD with helixone, but not with cellulose triacetate membranes, showed the presence of proteins associated with both the coagulation cascade and PLT activation,29,30 suggesting the material’s active role in modulating these biological processes. Assuming that the major mechanisms for a reduced PLT count could be an increased activation and destruction of PLTs and that the interaction between blood–dialysis membrane triggers in a related way the activation of the coagulation cascade, the concomitant involvement of the alternative pathway of the complement, associated with the stimulation of neutrophils and the release of mediators, could explain at least in part the results of our second related study, in which we reported differences in the hemodynamic pattern between the same two membranes with a tendency toward a more pronounced hemodynamic imbalance for Filters A.31 Observation is also supported by the fact that activated PLTs release nitric oxide, which in turn could be involved in the tendency toward hypotension.32 Moreover, it was reported that nonspecific hypersensitivity reactions with synthetic membranes are more common with PSf-based biomaterials.33 Overall, our previous findings and the potential different long-term impact of similar PSf membranes on PLT count support the concept that the traditional classification of biocompatible and bioincompatible HD membranes in two groups, synthetic and cellulosic, is not exhaustive and needs both further targeted investigations and reclassification. The FX membranes could induce a lasting decrease in PLT count and cause significantly more thrombocytopenia; the phenomenon seems to be related to its physicochemical structural characteristics, might involve humoral pathways, and could have hemodynamic consequences. In the HD scenario, even if the laboratory and clinical peculiarities demonstrated are at the edge of clinical significance, it could become crucial to take into account the substantial heterogeneity among “PSf-based” membranes and to consider that some effects may be overlooked evaluating only the routine predialysis blood sampling in the short term. Dialysis units, as previously described, might consider adding extemporary postdialysis CBC sampling in order to increase the sensitivity to membrane-related adverse effects on the PLT count.15 A risk–effects-based classification of nominally similar HD membranes could become a specific topic for a patient-tailored treatment and needs further specific targeted investigations. We have however to acknowledge some limitations of our study: the cross-sectional design, the small amount of patient files and dialysis sessions analyzed, and the absence of measurable clinical effects of the highlighted decrease in PLT count/thrombocytopenia. Longitudinal randomized studies are therefore needed to confirm our findings and to explore potential clinical consequences. The abstract of this paper was presented at the 48th Annual Meeting Swiss Society of Nephrology as a poster presentation with interim findings. The poster’s abstract was published in “Poster Abstracts” Supplementum 221 ad Swiss Med Wkly 2016;146 November, 2016. Luca Gabutti and Rosaria Del Giorno designed the study, analyzed the results, and drafted the manuscript. Lorenzo Berwert, Silvio Pianca, Giorgia Bianchi, and Olivier Giannini contributed to the preparation and the revisions of the manuscript. All authors contributed toward data analysis, drafting and revising the paper and agree to be accountable for all aspects of the work. Gafter U, Bessler H, Malachi T, Zevin D, Djaldetti M, Levi J. Platelet count and thrombopoietic activity in patients with chronic renal failure. Nephron. 1987;45:207–210. Vicks SL, Gross ML, Schmitt GW. Massive hemorrhage due to hemodialysis-associated thrombocytopenia. Am J Nephrol. 1983;3(1):30–33. Verbeelen D, Jochmans K, Herman AG, Van der Niepen P, Sennesael J, De Waele M. Evaluation of platelets and hemostasis during hemodialysis with six different membranes. Nephron. 1991;59(4):567–572. Amato M, Salvadori M, Bergesio F, Messeri A, Filimberti E, Morfini M. Aspects of biocompatibility of two different dialysis membranes: cuprophane and polysulfone. Int J Artif Organs. 1988;11:175–180. Kuwahara T, Markert M, Wauters JP. Biocompatibility aspects of dialyzer reprocessing: a comparison of 3 re-use methods and 3 membranes. Clin Nephrol. 1989;32:139–143. Hoenich NA, Woffindin C, Stamp S, Roberts SJ, Turnbull J. Synthetically modified cellulose: an alternative to synthetic membranes for use in haemodialysis? Biomaterials. 1997;18(19):1299–1303. Drews RE, Weinberger SE. Thrombocytopenic disorders in critically ill patients. Am J Respir Crit Care Med. 2000;162:347–351. George JN, Aster RH. Drug-induced thrombocytopenia: pathogenesis, evaluation, and management. Hematology Am Soc Hematol Educ Program. 2009;153–158. Yang RC, Lindsay RM. Dialyzer reactions in a patient switching from peritoneal dialysis to hemodialysis. Hemodial Int. 2005;9:120–126. Post JB. Thrombocytopenia associated with use of a biocompatible hemodialysis membrane: a case report. Am J Kidney Dis. 2010;55:e25–e28. United States Food and Drug Administration. Manufacturer and user facility device experience. Available from: http://www.accessdata.fda.gov/scripts/cdrh/cfdocs/cfmaude/search.cfm. Accessed June 15, 2016. Olafiranye F, Kyaw W, Olafiranye O. Resolution of dialyzer membrane-associated thrombocytopenia with use of cellulose triacetate membrane: a case report. Case Rep Med. 2011;2011:134295. Posadas MA, Hahn D, Schleuter W, Paparello J. Thrombocytopenia associated with dialysis treatments. Hemodial Int. 2011;15:416–423. De Prada L, Lee J, Gillespie A, Benjamin J. Thrombocytopenia associated with one type of polysulfone hemodialysis membrane: a report of 5 cases. Am J Kidney Dis. 2013;61(1):131–133. Kiaii M, Djurdjev O, Farah M, Levin A, Jung B, MacRae J. Use of electron-beam sterilized hemodialysis membranes and risk of thrombocytopenia. JAMA. 2011;306(15):1679–1687. Vicks SL, Gross ML, Schmitt GW. Massive hemorrhage due to hemodialysis-associated thrombocytopenia. Am J Nephrol. 1983;3:30–33. Nasika S, Janga K, Greenberg S, et al. Polysulfone dialyzer as the cause of thrombocytopenia in an ESRD patient (Abstract No. 138, NKF Spring Clinical Meetings, 2009). Am J Kidney Dis. 2009;53:B57. Koordinationsstelle Forschung am Menschen [homepage on the Internet]. The portal for human research in Switzerland. Available from: http://www.kofam.ch/it/domanda-e-procedura/progetti-non-soggetti-allobbligo-di-autorizzazione/. Accessed June 15, 2016. Hayama M, Yamamoto K, Kohori F, Sakai K. How polysulfone dialysis membranes containing polyvinylpyrrolidone achieve excellent biocompatibility? J Membrane Sci. 2004;234:41–49. Krieter DH, Morgenroth A, Barasinski A, et al. Effects of a polyelectrolyte additive on the selective dialysis membrane permeability for low molecular-weight proteins. Nephrol Dial Transplant. 2007;22(2):491–499. Radovich JM. Composition of polymer membranes for therapies of end-stage renal disease. Contrib Nephrol. 1995;113:11–24. Kokubo K, Kurihara Y, Kobayashi K, Tsukao H, Kobayashi H. Evaluation of the biocompatibility of dialysis membranes. Blood Purif. 2015;40:293–297. Bat T, Bat BE, El-Moghraby A, et al. Thrombopoietic status of patients on haemodialysis. Br J Haematol. 2016;172(6):954–957. Salvadè I, Del Giorno R, Gaetano D, Gabutti L. Assessing the contact-activation of coagulation during hemodialysis with three different polysulfone filters: a prospective randomized cross-over trial. Hemodial Int. 2017;21(3):375–384. Mares J, Thongboonkerd V, Tuma Z, Moravec J, Matejovic M. Specific adsorption of some complement activation proteins to polysulfone dialysis membranes during hemodialysis. Kidney Int. 2009;76(4):404–413. Urbani A, Lupisella S, Sirolli V, et al. Proteomic analysis of protein adsorption capacity of different haemodialysis membranes. Mol Biosyst. 2012;8(4):1029–1039. Kuragano T, Kuno T, Takahashi Y, et al. Comparison of the effects of cellulose triacetate and polysulfone membrane on GPIIb/IIIa and platelet activation. Blood Purif. 2003;21(2):176–182. Lefkovits J, Plow EF, Topol EJ. Platelet glycoprotein IIb/IIIa receptors in cardiovascular medicine. N Engl J Med. 1995;332(23):1553–1559. Urbani A, Sirolli V, Lupisella S, et al. Proteomic investigations on the effect of different membrane materials on blood protein adsorption during haemodialysis. Blood Transfus. 2012;10 (Suppl 2):s101–s112. Pieroni L, Levi Mortera S, Greco V, et al. Biocompatibility assessment of haemodialysis membrane materials by proteomic investigations. Mol Biosyst. 2015;11(6):1633–1643. Bianchi G1, Salvadé V, Lucchini B, et al. Assessment of subjective and hemodynamic tolerance of different high- and low-flux dialysis membranes in patients undergoing chronic intermittent hemodialysis: a randomized controlled trial. Hemodial Int. 2014;18(4):825–834. Noris M, Benigni A, Boccardo P, et al. Enhanced nitric oxide synthesis in uremia: implications for platelet dysfunction and dialysis hypotension. Kidney Int. 1993;44(2):445–450. Alvarez-de Lara MA, Martín-Malo A. [Hypersensitivity reactions to synthetic haemodialysis membranes – an emerging issue?] Nefrologia. 2014;34(6):698–702. Spanish.